CULLMAN COUNTY – Next week, all teams in The Cullman Tribune/Cullman Sense coverage area will get away from grueling and intense play of regional games in the Alabama High School Athletic Association. Some teams may wish they could stay in the regional schedule and keep up their momentum after claiming a victories Friday night during the fifth week of the regular season. Things are looking good for the Cold Springs Eagles at the present time. The Eagles are locked in a first-place tie with the Tanner Rattlers and Cleveland Panthers in 2A, Region 7 after Cold Springs drilled Falkville 48-22 on homecoming at Cranford Stricklin Stadium. Rod Elliott's Eagles are 2-0 in the region as is Tanner with Cleveland 3-0. West Point got a major win on the road, pulling it out over Corner 23-20. The Warriors are on the heels of Mortimer Jordan (3-0) and Hayden (2-0) in 5A, Region 6. Don Farley's bunch is 2-1 in the region, currently in third place. An 0-2 start in 6A, Region 7 was laid to rest Friday night for Cullman, who romped over Fort Payne 34-10. The Bearcats get out of the basement in the region and have some momentum when they resume region play in two weeks with Pell City visiting Woodard Stadium. Hanceville battled hard all evening, but fell to undefeated J.B. Pennington 44-30. The Bulldogs dropped to fifth place in 3A, Region 6 at 1-2. Pennington and Fultondale are on top with Locust Fork 2-1 in the region then Holly Pond at 1-1, followed by Hanceville. Good Hope, Vinemont and Fairview are winless in region play. The Raiders were shut out 41-0 at Cordova, the Eagles lost at Fultondale 55-14 and the Aggies suffered a 45-21 loss at West Point Stadium to Mortimer Jordan. Good Hope was playing the No. 6 team in the 4A state rankings with Fairview taking on the No. 4 team among 5A schools across Alabama. In a highly anticipated matchup of undefeated teams in Winston County, No. 7 Addison demolished Lynn 48-14. The Bulldogs are 5-0 and 3-0 in 1A, Region 7. Meek broke a three-game losing streak in a 40-8 win against Gaylesville in a non-regional assignment in Arley. What to look forward to in the first day after fall becomes official on Sept. 22? Non-regional games with one huge rivalry resuming as Good Hope plays at Cold Springs. The Raiders and Eagles clash for the first time since 2005 with Good Hope winning 27 of 34 battles between the two in a rivalry that began in 1970. Vinemont journeys to Addison. The Eagles and Bulldogs have gone to battle 26 times with Addison winning 19. Last season was a shootout in which the Bulldogs outscored the Eagles at Mark Smothers Stadium 42-33 in the opener. Cullman visits Fayette County. The Bearcats and the Tigers play for the third consecutive year with Fayette County leading the series 3-2. Cullman stunned the Tigers in 2015 by the score of 34-19 at home. Fayette County recovered from the loss to the Bearcats and advance to the 4A state championship game. Fairview meets Priceville at West Point Stadium. The Aggies and Bulldogs have played twice, but it has been since 2009 when they went head-to-head. Fairview won that year 54-12. The Aggies are trying to break a three-game losing skid. New games come up for Hanceville and Holly Pond. The Bulldogs take on Clements at Ray Talley Stadium. Clements is coached by former West Point athlete Cody McCain. This series was arranged back in the spring when Danny Miller was the head coach for the Bulldogs at that time. Holly Pond has newcomer Asbury visiting Thomas-Michelfelder Field for homecoming. The Broncos look to get back into rhythm after having Friday off to heal from a series of injuries that has reduced the depth in the line of scrimmage. West Point will get the week off. The Warriors will scout Fairview who will play on West Point turf due to Dafford Smith Stadium still out of commission. The Aggies have been playing at West Point while the Warriors have been on the road. Fairview will be at West Point for three straight weeks with the two to battle it out in the region on Sept. 30. Regional play will run from the 30th through Oct. 21 as teams will try to set themselves up for the best finish in their respective regions. The top four teams per region qualify for the AHSAA playoffs with opening round play scheduled for Nov. 4. Nic Rollo of Cold Springs – Rushed for 274 yards and scored four touchdowns in Eagles' 48-22 win over Falkville. Kevin Brakefield of Cold Springs – Returned an interception 30 yards for a touchdown in the second quarter of the Eagles' homecoming game. Cameron Moore of West Point – Rushed for 296 yards and scored two touchdowns during the Warriors' 23-20 win at Corner. Kolton Easterwood of West Point – Scored on a 1-yard run with 13 seconds left to give the Warriors a huge road win in 5A, Region 6 against Corner. 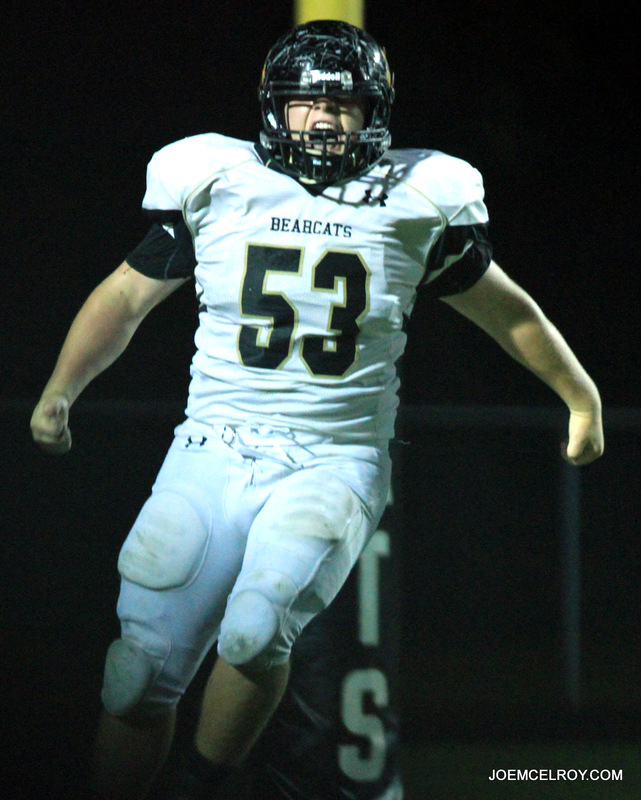 Carson Freeman of Cullman – Caught two touchdown passes to help the Bearcats defeat Fort Payne 34-10 on the road in 6A, Region 7. Fletcher Jennings of Cullman – Threw for two touchdowns, one per half as Cullman outscored Fort Payne 24-0 in the second half to get first region win of the season. Zeb Maze of Addison – Scored three touchdowns on 100 yards rushing in a 48-14 rout of Lynn in 1A, Region 7. Noah Rice of Addison – Accounted for 113 yards and two touchdowns to help the Bulldogs stay undefeated and go to 3-0 in the regional standings. Brenan Hurst of Hanceville – Threw for 147 yards and a touchdown in the Bulldogs' 44-30 loss to undefeated J.B. Pennington. Kaine Yates of Hanceville – Caught four passes for 104 yards and had two touchdowns, one rushing score, in this 3A, Region 6 game with Pennington. B.J. Smalls of Hanceville – Ran for a 77-yard touchdown on the first play from scrimmage for the Bulldogs. Finished the night with 111 yards rushing.